In the recent success of the PIPS Newry and Mourne skydive 2014 consisting of 16 fantastic locals all 16 individuals made the brave 13,000ft jump and altogether raised a great £8258 for the charity. Four friends from this group Shireen Ryan, Lynne Marks, Cathal Farrelly and Karen Hanna spent months fundraising and had many generous sponsors. 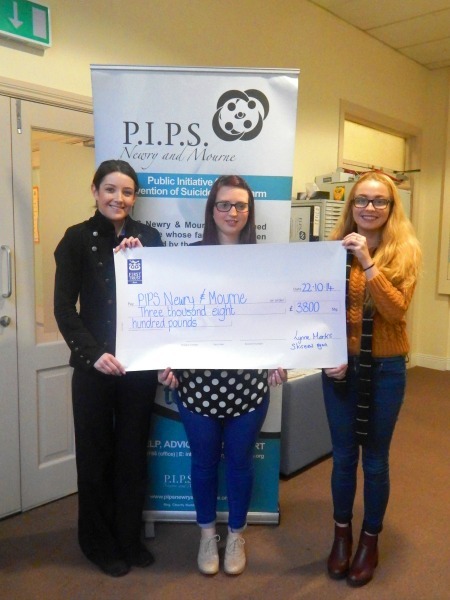 These four friends who all work at the Fiveways Newry, raised together £3800 and below Shireen and Lynne present this to PIPS Newry and Mourne Amy Henshaw. They would like to take this opportunity to thank McCartans Pharmacy, Occasions, Beyond Vanity, Franco Barberio, Flowers by Sinead, and every single family member and friend who donated to them. PIPS N&M would like to give great congratulations to all of you, you were all so dedicated in your fundraising efforts and we are glad you all enjoyed the jump.